Community Solar is a new option for many consumers. Getting the most out of Community Solar and determining if it is right for you requires a solid understanding of what it is and how it works. Community Solar is a way for many qualified consumers to participate in the financial benefits produced by a single, larger solar project in or near their community, instead of installing systems on their rooftop or property. While the mechanics differ by state, the main idea of Community Solar is that customers are able to participate directly in the production of a specific, independent, local solar project and realize immediate savings on their utility bills, with no up-front costs, nothing installed on their rooftops, and no back-end costs or equipment removal. Who is Community Solar for? Community Solar is for consumers who want to see new solar facilities built in their area but who can't (or don't want to) install rooftop solar. Studies have shown that up to 80% of consumers cannot install panels on their rooftops, for a variety of reasons: the initial up-front costs may be too high, their roofs may not face the right direction (or may not have the right pitch), or they rent their homes. Community Solar offers these customers a way to support local solar projects by independent developers - and to start saving money immediately on their utility bills with no up-front cost! Each month, you will be allocated a percentage of the output of a specific Community Solar project. Your utility will translate this output into credits that appear directly on your utility bills. At the same time, you'll also receive a bill from Syncarpha, for payments for those credits - but at a discount. The difference between the credits you receive on your utility bill and the bill you receive from us for discounted credits will equal your savings each month. Does it cost me anything up front? No. Once we've worked with you to determine whether you qualify, you simply need to sign our agreement and wait for the project to "go live." When the project does start operating, you'll start to see savings on your utility bills. After that, you simply need to pay us for the credits you've received each month. How can that work? That sounds too good to be true. We understand that "no money down" and going solar with no up-front investment both sound too good to be true. So how does it work? Simply put, your commitment to buy the credits - at a discount - makes the project possible, as we can build with confidence that we have enough customers and revenues committed to support our project for the long-term. We're able to offer the credits at a discount, because having everyone participating together allows for economies of scale that we pass along to you. Community solar is a real-life example of people banding together to increase the potential benefits for all. Our Resources page provides even more information on how it works. What if I get more credits than I can use in a month? Solar generation varies, and Community Solar programs are designed to reflect the chance that some months you may get more credits than you can use - in these cases, credits can be "banked," to be used in months where your usage and utility bill is higher than the value of your Community Solar credits. For example, in Massachusetts, these credits can be "banked" indefinitely. Note that we'll work with you when you sign up to make sure that your Community Solar "credit allocation" makes sense relative to your total annual energy usage. What about when the sun doesn't shine? Does it cost me money in the winter, on cloudy days, etc.? Even on cloudy days and during the winter months, solar energy is still produced, just at a lower rate. During those months, you simply won't receive as large a credit as you might receive during sunnier months. Remember - you haven't paid anything up front and only pay - at a discount - as credits are produced and allocated to your account. How does Community Solar compare to having panels on my roof? Rooftop solar and Community Solar are very different "flavors" of solar, and it is important to note that everyone's situation is different. Generally, rooftop solar requires a more significant initial investment and customers must be willing to install, house and maintain panels on their rooftops for 20+ years (at the end of which, something must be done with the panels). In return for this increased complexity and long-term financial and physical commitment, the economics of rooftop solar can potentially be very rewarding over time, and customers may also receive tax benefits and other environmental attributes, when applicable, in addition to energy savings. On the other hand, Community Solar participation requires no up-front costs, nothing installed on your rooftop, and no ongoing site maintenance or panel removal. There is also greater flexibility for customers who want to move and take Community Solar with them, transfer the agreement to another qualified customer, or cancel (see our contract for more details). Most importantly, Community Solar customers start saving immediately, with no up-front cost! Do I own a specific panel? No. We try to keep Community Solar simple and accessible for as many people as we can - as a result, participants do not own a specific panel or a share or ownership interest in our projects, as those kinds of agreements can get very complicated, quickly (as they could start to lead to a whole range of expensive legal and regulatory requirements). Instead, you and a limited number of others will simply participate in the project's output each month by receiving a pre-determined percentage of production translated into a credit on your utility bill. However, you will be able to track your participation online - and see how much you're saving and how much your participation is contributing to the growth of solar and the greening of your community! Will you become my utility or electric provider? No. 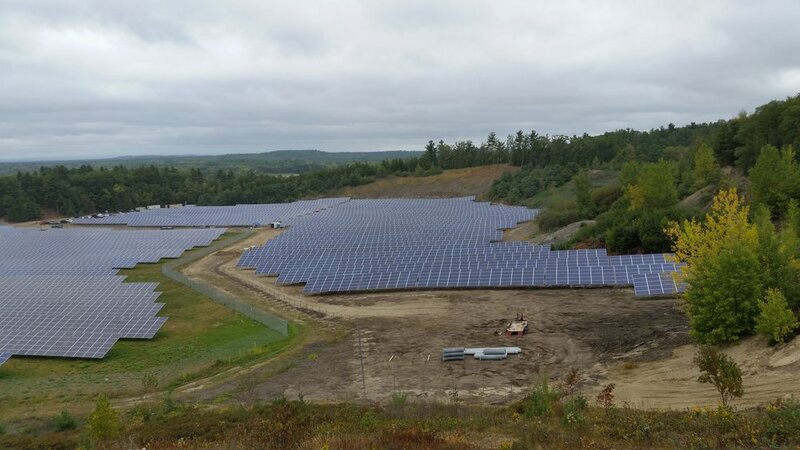 Community Solar projects generate credits for consumers, not electricity. Community Solar does not replace your utility or your competitive electric provider (if you have one). Instead, Community Solar is a separate arrangement between you and us. You will still need to maintain an electric utility account and a connection to the electric distribution system. Can I change competitive electric suppliers and/or leave or go back to my utility? Yes. You'll still be free to switch electric suppliers as you see fit or go back to your utility from a competitive supplier, if you wish. However, we do recommend that, before switching suppliers, you talk to us first, so that we can ensure that your monthly credits are applied correctly. This sounds great. Am I eligible? We will help you determine if you're eligible for one or more of our projects. In general, most community solar programs require that you live in the same utility service territory and/or electric "load zone" as the project. This is the case in Massachusetts and New York, but requirements vary by state. Our online form can help you start to determine if you qualify. Please go through our registration process or contact us to learn more, and we can guide you through it. Moves happen - we get that. While our agreements will differ by state and by community solar program, in all cases, we provide flexibility for customers who need to move. If you move locally, your Community Solar credits and savings move with you! And if you move outside the service area, you can transfer your credits to someone else or cancel the agreement - we'll help you decide which works best. Community Solar is a new concept for a lot of people - we get that, too. We'd love to find a way to help you and your family, friends, and community participate in Community Solar through a specific project, and we also want to do our part to spread the word about Community Solar, to educate consumers on this exciting new offering. We're here - to answer your questions and tell you more about the program. Contact us at 888-55-SOLAR or communitysolar@syncarpha.com.